Independent doctors are closing up shop or going to work at hospitals or bigger group practices where they aren't directly responsible for overhead costs. 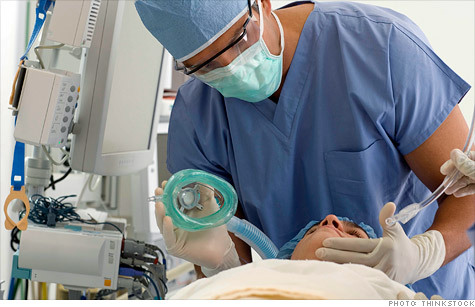 NEW YORK (CNNMoney) -- The solo doctor is a vanishing breed. Squeezed by high costs and shrinking insurance reimbursements, independent doctors are closing up shop or going to work at hospitals or bigger group practices where they aren't directly responsible for overhead costs. Fresh insight on the trend came this week in a report from one of the country's largest physician recruiting firms. The finding: By 2014, two-thirds of the nation's nearly 1 million doctors will be employed by hospitals. As hospitals staff up, they are plucking off physicians who once ran independent practices but couldn't afford to stay in business, said Travis Singleton, senior vice president with Merritt Hawkins, a physician recruiting and consulting firm that did the survey. "Our projection reaffirms the trend that fewer and fewer doctors are going into solo practice or staying in solo practice," said Singleton. Merritt Hawkins conducts about 3,000 searches annually on behalf of hospitals, group practices, small independent practices and community health centers. In 2011, Singleton said just 1% of all searches it conducted for its clients were for solo physicians, down from 22% in 2004. "This is the lowest level in the 28-year history of our firm," said Singleton. "It shows that no one wants to hire a solo doctor, no one wants to be a solo doctor. This is a dying breed of physician that is quickly disappearing from the American landscape," he said. This is not a new trend. More than half of practicing physicians are employed by hospitals, a figure that has doubled over the last decade, according to Dr. Robert Kocher, who wrote an article on the issue last year in the New England Journal of Medicine. "Hiring of physicians by hospitals definitely accelerated since 2008 as the economy weakened, reimbursements to doctors were shrinking and health reform passed," said Kocher, a partner with venture capital firm Venrock and a former Obama administration health care official. The Merritt Hawkins' survey also showed that 63% of all of Merritt Hawkins' searches in 2011 were for hospitals looking to hire more doctors, up from 56% in 2010 and compared to a much lower 11% in 2004. If this pattern continues, the firm also estimates that more than 75% of newly hired physicians will be employed by hospitals within two years. How a "solo" doctor practices today is dramatically different from 20 or 30 years ago. "Back then, the solo doctor was truly independent," explained Singleton. "They had the financial means to pick a place, set up their office, hire their staff and get going." But the economics of delivering health care have changed considerably over the years, making it much more expensive for doctors to run an independent office. "These doctors have to pay their employees, pay for the infrastructure, legal compliance and new IT requirements that the government has mandated," Singleton said. And as their business costs keep going up, doctors aren't seeing more money coming in. "Their reimbursements from insurers are either going down or staying steady," he said. The closing of independent practices hurts rural communities outside the reach of large hospitals particularly hard. What's more, young doctors joining the profession aren't enthusiastic about solo practice either, said Singleton. "This new generation wants to have a quality of life instead of money problems and a large caseload of patients," he said.